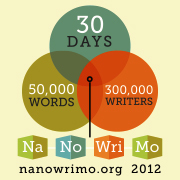 From Reader to Writer, Week 1: Greetings from #NaNoWriMo! This Pretty Staffer has high hopes of joining the ranks of those we've been blogging about this past year and nearly four months. As such I (and "well over 200,000 people around the world" ) am taking part in a little event that spans the month of November called NaNoWriMo! Or, for those of you not yet in the know, National Novel Writing Month. NaNoWriMo turns the month of November in to a month to avoid your wordy friends. many among us will become severely sleep deprived, overly caffeinated, and often malnourished (junk food becomes brain food, and all that jazz) zombies. We'll be stressed over word counts and self-conscious about the crap spewing from our brains that we aren't allowed to edit until December. By the end of the month, we'll become an overall-irritable bunch that might snap at the slightest provocation. Why, then, would we willingly volunteer to partake in an event that could bring out our nastiest of sides? Because for many of us, November also turns into a month that shows us we, too, have what it takes to become an author. For many of us, November turns "One day, I'm going to write a novel" into "I wrote a novel in a month!" Sure, what we find on paper or on our computer screens at the end of 30 days may be complete, unadulterated crap but, by that time, the point is we wrote our novels. That, right there, is something to be proud of and a goal to strive toward. We can worry about perfecting the stupid thing later, when we aren't sick of looking at it. So, what do you think, Pretties? Do you have what it takes to write your hearts out for 30 straight days? If you're already a fellow WriMo, post your woes and successes down below! If you're not, and you'd like to try your luck, it's only day two and there's still plenty of time. You can sign up by following this link here. As for me, I will keep you guys updated on my progress these next few weeks both here, and on The Write Reads. As such, you can expect to find little blurbs, clips and excerpt from my NaNo novel through out the month, the first (and longest) of which you can find right here, exclusively on Pretty in Fiction and NaNoWriMo! Read Chapter 1 of My NaNo Novel! “When she slipped out that night, she didn’t know it would be her last. If she had, she would have done things differently. Had she known, she wouldn’t have slipped out at all. At least that’s what she told herself. Alana Porter had just turned sixteen one week ago. Now she was dead, and no one even knew. Well, someone knew, but Alana couldn’t remember who. That night was all a bit hazy, and it hurt her head to try and remember. Did ghosts even have heads? That’s what she was now, wasn’t it? A ghost? “Focus, Alana,” she muttered to herself. If ghosts could even mutter. She pushed herself up from, well, whatever was beneath her. It was too dark to know. Too dark to even guess. She brushed herself off out of habit, more than any need to knock something from her clothes. She was still wearing clothes, though, so that had to count for something. She was standing in nothing. That was the only way Alana could describe it: nothing. The darkness prevented her from seeing anything. There was nothing to smell, nothing to hear. There wasn’t even air to taste yet, Alana noticed, she still went through the motions of breathing. Alana lifted her arms out at her sides. She hoped she would at least be able to feel something. She spun in a slow circle, arms held high, but felt nothing. She walked a few paces forward, arms stretched out before her, hoping to catch a wall before she crashed into it. Still, Alana felt nothing. And then she remembered the ground beneath her feet. She had walked on it, pushed herself off of it. There was something beneath her, Alana was sure. She crouched down, and put her hands on the the floor, only they went further than the floor should be. That couldn’t be right. She tried again, same result. There was nothing beneath her. Still, something was holding her up. With one, shaky hand, Alana reached down, past the floor, and curved her hand back up to her foot. She hesitated, steeling herself, but sure she would find something there beneath her. She did, but it wasn’t what she expected. When Alana’s fingers finally made contact with something solid, it was only to find she was touching the sole of her sneakers. Alana panicked. Her throat tightened, forcing shallow, non-existent breaths. With as much force as she could muster, she threw herself back from the nothingness that held her up only to land, hard, on more of it. How could nothing hold her up? It defied all laws of nature. She had to do something. Before Alana had a chance to think of what that something was, she was flooded in whiteness. Everything that had been black and dark before was now a blinding white. As much as she couldn’t see before, she could see now. Not that this newfound sight helped Alana determine anything about where she was. The entire place was seamless. Alana couldn’t make out where the ceiling met the walls and the walls met the floor. She couldn’t even differentiate between one wall and another. It was all just white. An endless sea of white. She pushed herself off the nothing again. How, she didn’t know, she just did. She looked at her hands, then crouched down. With just a finger, she tried to touch the ground. Like before, the finger slipped right past the bottom of her shoe. The only difference now was that she could see it happen. Still, she didn’t believe it. From off in the distance there was a sound, a hum. Alana stood, brushed off her pants,and strained her ears to hear it. Nothing. She crinkled her brow and tried again, tucking her hair behind her ear. Still nothing. Alana shook her head. She must be going crazy. And then she heard it again. It was louder and stronger than before, but she was sure it was there. Alana didn’t move, didn’t do anything. She was scared it would disappear again, and she couldn’t let that happen. She had to figure out what it was she was hearing. This was not right. She was not supposed to be dead yet. Alana knew that already, she was too young to be dead. But that wasn’t it, either. She just wasn’t supposed to be dead yet. Someone messed up. Well, not someone, something. And she had to fix it. Alana would be sent back, and it was up to her to make it right. Only Alana could fix this. If she remembered. Hope you guys enjoyed that first chapter! Encouragement and constructive criticism are always welcome friends. To all my fellow WriMos: God luck, and I'll see you on the other side of 50,000 words! Great first chapter! This is my 4th year doing nano and I love it. The crazy deadline does wonders for getting me to turn off my inner editor and write, even if it's bad. Some great stuff can come out of that bad writing, you'd be surprized. It's great so far! Love it so far! Can't wait to read more.